Yesterday, my fellow Indy K12 writer David McGuire Wrote, “Teacher Attendance Matters.” As a school principal, I know he is under pressure to ensure his students receive the best education. The heart of his piece was to emphasize how teacher absences can bring challenges to schools including student achievement. 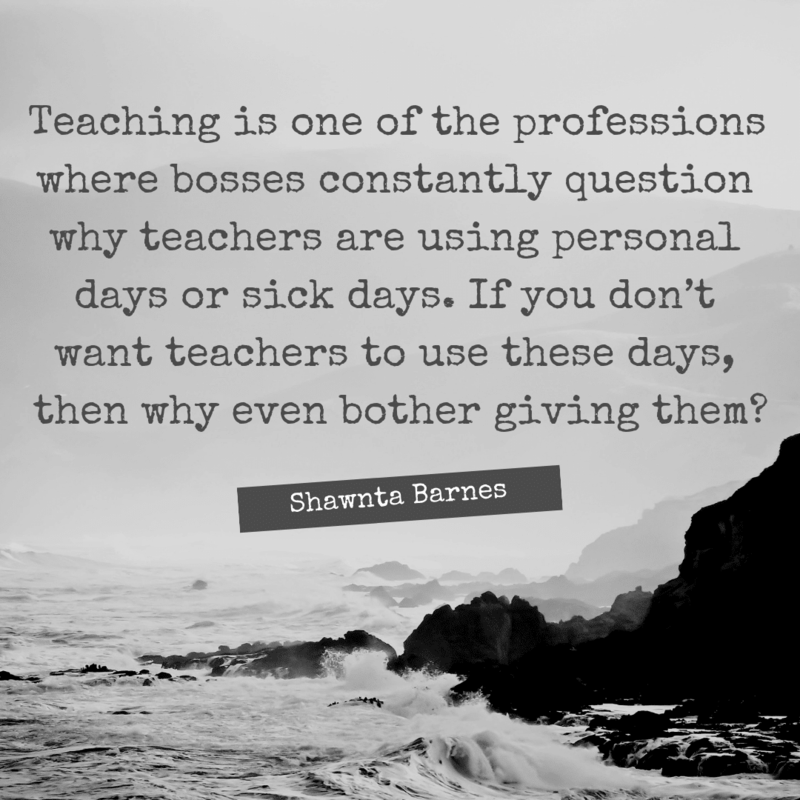 Teaching is one of the professions where bosses constantly question why teachers are using personal days or sick days. If you don’t want teachers to use these days, then why even bother giving them? Realistically, everything cannot be done over a school break, so let’s throw that argument away. My identical twin sons were born ten weeks early. I was on bedrest for 16 weeks before they were born early, eight weeks at home and eight weeks in the hospital. Between my medical bills, and my sons’ medical bills we had almost $500,000 in bills. Yes, the insurance covered a significant portion, but we still had a lot left to pay. I had no choice but to return back to work, and the reception was chilly at best. Because my sons were born early, they had numerous appointments to monitor their health and development. They also had physical therapy. I was frequently absent for their appointments. To ensure I didn’t run out of days, I came to work when I was sick. Some of my colleagues were not understanding, and then I received a chart in my mailbox to inform me that I had missed 25% of my one of my English classes. This was followed up with an email demanding that I submit weekly lesson plans. At my school, no one turned in lesson plans weekly. At the end of the semester, we uploaded plans online. I refused to agree to the request. My father was a union rep at his job for years during my childhood. I knew what my rights were. I scheduled a meeting with the administration and my union where I was able to prove why I was absent, and I was not forced to submit lesson plans weekly. My absences were not questioned moving forward. What angered me the most was all the extra effort I put in to ensure my students were doing well. We were using My Big Campus at the time, and I would message students when I was at appointments with my sons to answer questions and to give feedback. I would write comments to them on Google Docs. Even though I did miss many classes, I still had better data than other teachers who had 100% or nearly 100% attendance…I’m still trying to figure that one out myself. That whole situation made me feel not valued. I already had colleagues making comments, and then the administration got on my back. I was stressed about my children’s progress and them being healthy. I was stressed about getting these medical bills paid. My students will tell you, for a year, I ate oatmeal every day for lunch as a cost-cutting measure to pay off those bills, which took three years to pay. The last thing I needed was my professionalism questioned. I never took off unless I had to take off. I was even told that my husband should do his part. He was; he took our boys to 50% of their appointments so I wouldn’t miss even more work. My husband was never harassed by colleagues or sent emails about his absences. He was treated like a professional. Life happens; people will be absent regardless of the profession. As I know from personal experience, teacher absences do not always equal student failure. I have given over 100% at every school I have been employed. Honestly, the best action teachers can take is taking a mental health day. If teachers are frequently calling in sick, then maybe the administrator needs to assess his or her role in the situation and other problems at the school to determine why some of the teachers in the school get what I call the Monday malady or the Friday flu. I’ll tell any administrator this, “Come at me about my absences at your own risk.” I know my value and how I’m an asset to any school where I work. When we demean teachers, who are professionals, we push the good ones out the door. I assert more teachers need to stand their ground and not let other colleagues or administrators bully them about why they are absent.